Pinecam.com • View topic - Spring time = vaccine time! 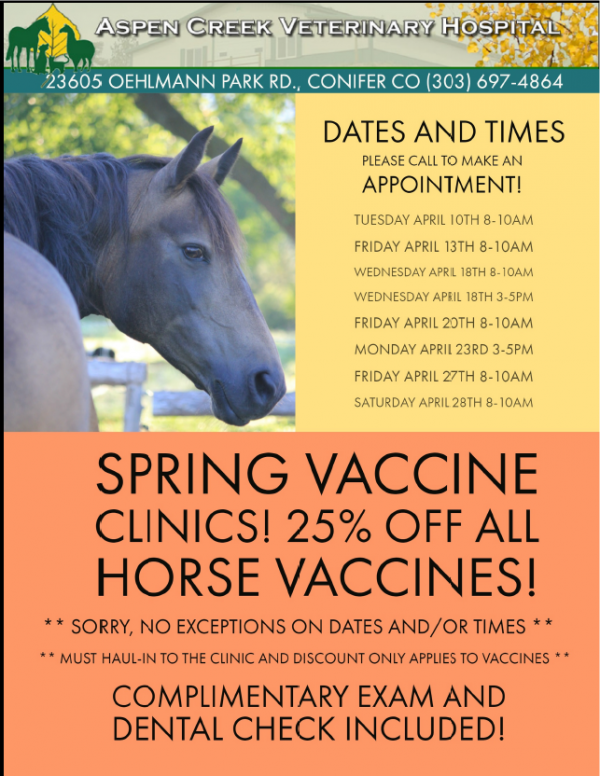 Save 25% on Horse Vaccines! Spring time = vaccine time! Save 25% on Horse Vaccines! Post subject: Spring time = vaccine time! Save 25% on Horse Vaccines! Spring has sprung and now is the time to think about Spring Vaccines for your horses and other livestock. Mosquito born disease such as West Nile Virus, Eastern Equine Encephalitis, and Western Equine Encephalitis are transmitted during summer/fall and require annual vaccination each Spring for full protection. Additionally, horses should receive a rabies vaccination and tetanus vaccination once a year as well. Both tetanus and rabies are fatal if contracted. There have been numerous rabid bats found within Denver so far this year. There have also been reports of a rabid horse in Cheyenne, WY and a rabid llama in Douglas county within the past 60 days. Rabies can be transmitted from infected animals to humans, and is also 100% fatal in humans. The best protection for rabies is annual vaccination of all livestock and domestic pets. Many people also booster vaccines for Influenza and Herpesvirus (Rhino) twice yearly to reduce the risk of upper respiratory infections in their horses. This is especially important for horses at boarding stables and those who travel to shows and clinics. You Spring vaccine appointment is also a great time to check teeth, discuss deworming, and update your Coggins/EIA test for summer travel. Why have your veterinarian perform vaccinations? Vaccine manufacturers guarantee not only the efficacy of their vaccines, but also the safety of their products when administered by a veterinarian. Vaccines obtained through other means have no guarantee of safety or efficacy. Additionally, vaccination is a wonderful time to have your veterinarian look over your horses and discuss any concerns you may have. Haul in to our hospital facility in Conifer during one of our vaccine clinic times for discounts. Complimentary wellness exams, dental checks, weight taping, and body condition scoring will be provided as well. Please note - Must haul in for discounts. No exceptions to days and times. Discounts are for vaccines only. Other services are regularly priced Appointments are required. See http://www.aspencreeklac.com for more details and times/dates.